[This] is a point that has been made many, many times. We all have a hermeneutic. We are all interpreting the text to some degree. We are all privileging–deferring to–certain values, doctrines, creedal commitments, traditions, or biblical texts. Something somewhere is trumping something else. In a document as multivocal as the Old and New Testament this is unavoidable. So we all have a hermeneutic. The only question is whether you are consciously vs. unconsciously using a hermeneutic. The deepest arguments I’ve observed in church come down to this. There are times when self-interest, winning for its own sake, holding the power, and so on, have largely been eliminated. Or, at least, we have seen them clearly and have them under control. But something else has meant an irreconcilable difference has persisted. In our hearts we have felt of each other: “you know neither the scriptures nor the power of God… you are quite wrong.” (Mark 12:24-27) And sometimes we have said as much to each other. The text this week describes the fundamental difference in hermeneutic between Jesus and his opponents. Mark takes good care to list all Jesus’ opponents in Chapters 11 and 12: “the chief priests, the scribes, and the elders,” (11:27) the “Pharisees and Herodians,” (12:13) and the Sadducees. (12:18) Although “the whole crowd was spellbound by his teaching,” (Mark 11:18) he was attacked by the entire religious establishment. We have come to the centre of the gospel and its hermeneutic, for Jesus’ first words in this gospel are, “The time is fulfilled, and the kingdom of God has come near; repent, and believe in the good news.” (Mark 1:15) And here, talking with this scribe? We are “not far from the Kingdom of God.” It has indeed come near. In one sense, Jesus is no revolutionary in this text. Both he and the scribe lay out their understanding of what is most important, by quoting Scripture. Hear, O Israel: The Lord is our God, the Lord alone. 5You shall love the Lord your God with all your heart, and with all your soul, and with all your might. 6Keep these words that I am commanding you today in your heart. 7Recite them to your children and talk about them when you are at home and when you are away, when you lie down and when you rise.8Bind them as a sign on your hand, fix them as an emblem on your forehead, 9and write them on the doorposts of your house and on your gates. And the scribe carefully re-states and reinforces each of these texts. There is nothing here with which anyone could argue. The point of argument is the hermeneutic: which texts are being privileged? “to love him with all the heart, and with all the understanding, and with all the strength”, and “to love one’s neighbour as oneself”,—this is much more important than all whole burnt-offerings and sacrifices. It is this understanding which has brought the scribe “not far” from the kingdom of God and wins Jesus’ approval. Bill Loader outlines this in some detail, and I commend his post on this text. … by citing the second command, Jesus is making a profound theological move which seriously defines the first command and reveals his theology. The God to be obeyed is the God of love and compassion and, by implication, that understanding will determine what loving God and keeping God’s commandments means. There is no room for a tension or opposition between the two, no divided loyalties. Where love and law conflict, law gives way, or, better, love always goes beyond and, in that sense, fulfils the law. It controls law and not vice versa. In the gospel of John, (John 7:53 – 8:11) the hermeneutic of the scribes and Pharisees who bring the woman to Jesus, privileges Law. The Law says the woman must be stoned. Love is not part of the equation. The woman is reduced to a test of Jesus’ holiness before God; she is dehumanised. What hermeneutic drives us as we meet our neighbour in need? When we meet this woman, do we even see her as neighbour, or as someone in need? So often, I think, we want to get people right with God, (according to our definitions of right,) whilst ignoring their need: Do the right thing, and then we will help you. What is interesting to me in this phenomenon is not that we are all engaging in hermeneutics, acts of interpretation. That is a given. What is interesting to me is how self-awareness, or the lack thereof, is implicated in all this. Basically, fundamentalism–denying that you are engaged in hermeneutics–betrays a shocking lack of self-awareness, an inability to notice the way your mind and emotions are working in the background and beneath the surface. [What is at] issue… [is]… emotional intelligence, the degree to which you are reading the bible with a degree of self-awareness. This emotional intelligence goes beyond interpretation. It affects how we relate to our neighbour. It determines who we see as neighbour. It affects how we love God. It is the measure of our conversion. Emotional intelligence— emotional maturity, indeed— will determine how free we are to abandon the safety and certainty of rules, and step into the uncertain realm of love, where there are no boundaries on our responsibility, and no points at which we can limit love. It is to enter the realm of Spirit not far from the Kingdom of God. In a sense, this maturity, this conversion, ceases to be a hermeneutic, and becomes a way of being. It is who we are— or not. Now this is the commandment—the statutes and the ordinances—that the Lord your God charged me to teach you to observe in the land that you are about to cross into and occupy, 2so that you and your children and your children’s children may fear the Lord your God all the days of your life, and keep all his decrees and his commandments that I am commanding you, so that your days may be long. 3Hear therefore, O Israel, and observe them diligently, so that it may go well with you, and so that you may multiply greatly in a land flowing with milk and honey, as the Lord, the God of your ancestors, has promised you. 4 Hear, O Israel: The Lord is our God, the Lord alone. 5You shall love theLord your God with all your heart, and with all your soul, and with all your might. 6Keep these words that I am commanding you today in your heart. 7Recite them to your children and talk about them when you are at home and when you are away, when you lie down and when you rise.8Bind them as a sign on your hand, fix them as an emblem on your forehead, 9and write them on the doorposts of your house and on your gates. 28One of the scribes came near and heard them disputing with one another, and seeing that he answered them well, he asked him, ‘Which commandment is the first of all?’ 29Jesus answered, ‘The first is, “Hear, O Israel: the Lord our God, the Lord is one; 30you shall love the Lord your God with all your heart, and with all your soul, and with all your mind, and with all your strength.” 31The second is this, “You shall love your neighbour as yourself.” There is no other commandment greater than these.’ 32Then the scribe said to him, ‘You are right, Teacher; you have truly said that “he is one, and besides him there is no other”; 33and “to love him with all the heart, and with all the understanding, and with all the strength”, and “to love one’s neighbour as oneself”,—this is much more important than all whole burnt-offerings and sacrifices.’ 34When Jesus saw that he answered wisely, he said to him, ‘You are not far from the kingdom of God.’ After that no one dared to ask him any question. Our Christian gloomily sips his beer and worries about all the miracle stories in Mark. What’s a modern man got left to believe in along with his craft beer? The editor has no imagination. The Christian, like far too many of us, thinks that truth lies only in the veracity of facts. He has lost his tradition. But the Rabbi is thinking symbolically. She understands that the truth in this story of her people’s entry into the Promised Land lies not so much in the literal details— our amputated understanding of truth, but that it lies in the literary details. Bartimaeus is the last story in a series which were designed to completely upend and redefine people’s understandings about the long awaited Messiah of Israel. (Not to mention the fact that the crucifixion of Jesus seriously questioned claims that he was Messiah!) These stories radically challenge common ideas of success, and status, and the meaning of life. They claim to be healing our blindness about where life is to be found. When we read the story of Bartimaeus symbolically we find it calls us to throw off our security— Bartimaeus was a blind beggar, and leaving behind his cloak was to leave everything— and to follow Jesus into Jerusalem. How are we blind beggars? How would such a trust in Jesus— the word faith essentially means trust— make us well? Jesus said such trust made Bartimaeus well and was the source of his blindness being healed. Our Rabbi will remember, and probably before us, that Jerusalem was destroyed by the Romans. She may have read the Wikipedia article on Mark before coming out this evening. So she’ll know that Mark was calling people to follow Jesus to Jerusalem at a time when the destruction of Jerusalem was a foregone conclusion, or may already have happened. She will see the connection to the Romans’ laying waste of Jerusalem. And because she thinks in symbols, she will wonder why Mark sets the bringing down of the walls of Jericho alongside the destruction of Jerusalem as gospel, as good news! I’ve stereotyped the Rabbi as much as I have stereotyped the editor and the thoroughly modern Christian, although I hope you can see I admire her. Can you also see that unless we begin to understand and read what we call Old Testament, and learn it as our story, we will not understand Mark, or the other gospels, for they were written by people for whom the Tanakh was Scripture? This Testament of God provides the literary and symbolic underpinning of our gospels. The question of why Mark sets the bringing down of the walls of Jericho alongside the destruction of Jerusalem as gospel, as good news, is not the Rabbi’s question. God will speak to her, and question her, through the symbols and traditions of her people. The gospels are our stories. They ask this question of us. As stories of truth they are existential. They speak to me, as much as they lay down any general principles. So I quote loosely from this week’s newssheet at Pilgrim, using the personal pronoun. This is my question. What does the story of Bartimaeus ask of you? To see, and be made well, like beggar Bartimaeus, who sprang up and left behind his only security, his cloak, I must follow Jesus into Jerusalem. But Jerusalem, too, is a symbolic city in the drama of Mark: it is the symbol of all Israel’s hopes for fulfilment in its life with God. And we know that Jerusalem had become for many, a city of destruction, and a symbol of death. What is my Jerusalem? In the call to follow Jesus alongside Bartimaeus, Mark is confronting me with the inevitable fall of my City; the Jerusalem of my life, the great walled and protective city I have constructed even as I have tried to follow Jesus. He is calling me to face my death, and the death of all my pretentions, for this death is a foregone conclusion, just like the destruction of historical Jerusalem. But there is no “religious insurance policy” here. Indeed, the last few chapters of Mark have emphasised death and loss: “For those who want to save their life will lose it, and those who lose their life for my sake, and for the sake of the gospel, will save it,” he says in Mark 8:35. I’m not being given religion as some kind of security blanket, and if I use it like that, I am still blind. Somewhere in the upending of my human desires for power, and significance, and glory; somewhere in the decision to pay the cost of serving; somewhere in holding my life lightly, and in letting go of my desperate “amygdaline” need to survive at all costs; somewhere in walking toward death— all this is terrifying— Mark claims I will find freedom and true humanity and life. It is what our story calls resurrection. Direct Biblical quotations in this page are taken from The New Revised Standard Version Bible, copyright 1989, Division of Christian Education of the National Council of the Churches of Christ in the United States of America. Used by permission. All rights reserved. Please note that references to Wikipedia and other websites are intended to provide extra information , but that Wikipedia is never more than an introductory tool, and certainly not the last word in matters biblical! To read more, you can follow Andrew’s First Impressions, and articles written for Pilgrim on this part of Mark. They lead to this blog post. Stuart McMillan, President of the Uniting Church in Australia, with faith representatives and members of Parliament in Canberra on 15th October. 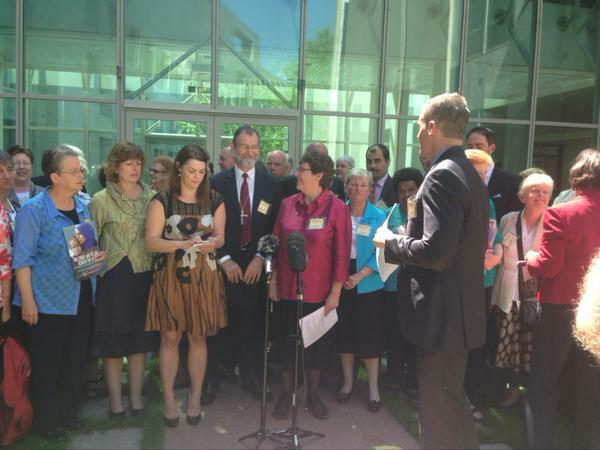 The President of the Uniting Church in Australia Stuart McMillan has joined faith representatives and members of Parliament in Canberra to support renewed efforts to restore some compassion to Australia’s asylum seeker policies. At a cross-party forum at Parliament House Mr McMillan described the continued abuse of asylum seekers in offshore detention centres as “inexcusable”. “In increasing numbers, courageous citizens are expressing their concerns about the inhumane and illegal treatment of people seeking asylum, especially children. “I applaud the actions of staff at Melbourne’s Royal Children’s Hospital in refusing to return children in detention to places where they are at risk of further abuse and trauma. Concerned citizens including many of deep religious faith continue to make their voices heard on this issue in public rallies and other peaceful protests. “It’s vital that we harness growing goodwill in the community to improve the plight of these most vulnerable people. “I congratulate MPs of principle and good faith who are not letting this matter rest in their party rooms or in public. 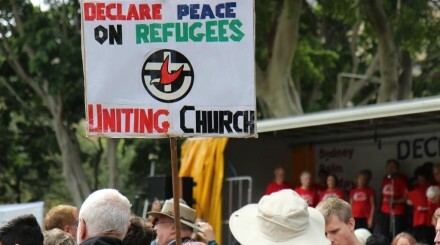 “The Uniting Church in Australia believes in the inherent dignity of all people. We believe that our commitment to Christ calls us to work for justice and to oppose all forms of discrimination. “So we stand together with all people of decency, of faith or no faith, for the welfare and dignity of asylum seekers,” said Mr McMillan. Representatives of different faiths agreed to form a working group with five MPs to advance the case for reform. In a media conference after the meeting, Mr McMillan restated the Uniting Church’s longstanding call for the closure of Australian immigration detention facilities on Nauru and Manus Island. Last month, Uniting Justice National Director Rev. Elenie Poulos and UCA President Stuart McMillan were two of 230 signatories on a citizens manifesto calling for changes to Australia’s asylum seeker policy. The statement seeks policies based on humanitarian principles, calls for an end to locking away innocent men women and children, and envisions a country that sees asylum seekers as an opportunity not a problem. “Citizens for Change on Asylum Seekers (CCAS) implores our politicians to give us leadership on the issue of refugees and asylum seekers. Community opinion has moved on and wants policies driven by humanitarian imperatives rather than the electoral needs of domestic politics.” said the statement. Anti-Poverty Week runs from 11-17th October this year, and aims to strengthen public understanding of the causes and consequences of poverty and hardship around the world and in Australia; and encourage research, discussion and action to address these problems, including action by individuals, communities, organisations and governments. It’s impossible to discuss extreme poverty without referencing extreme wealth. An Oxfam report has revealed that the world’s 100 richest people earned a stunning total of $240 billion in 2012 – enough money to end extreme poverty worldwide 4 times over, adding that the global economic crisis is further enriching the super-rich. Eighty people hold the same amount of wealth as the world’s 3.6 billion poorest people. “The richest 1% has increased its income by 60% in the last 20 years with the financial crisis accelerating rather than slowing the process,” while the income of the top 0.01% has seen even greater growth. For example, the luxury goods market has seen double-digit growth every year since the crisis hit, the report stated. And while the world’s 100 richest people earned $240 billion last year, people in “extreme poverty” lived on less than $1.25 a day. In the US, the richest 1%’s share of income has doubled since 1980 from 10 to 20%, according to the report. For the top 0.01%, their share of national income quadrupled, reaching levels never seen before.